Be the voice for a voiceless victim of America’s largest abortion chain Planned Parenthood aborted 323,999 children in the last year … while raking in more than half a billion taxpayer dollars. Enough is enough! Let’s send 323,999 baby socks to Congress — representing these voiceless victims of Planned Parenthood … and calling upon our elected officials to defund the abortion Goliath. DEFUND PLANNED PARENTHOOD BY SENDING 329,999 Baby Socks to CONGRESS! STEP 1: SEND A SOCK representing a voiceless victim of Planned Parenthood … and deliver a message calling upon Congress to defund the abortion chain. STEP 2: PIN A SOCK on your backpack, coat, or garment to publicly show your support for protecting babies from the violence of Planned Parenthood. STEP 3: TELL YOUR FRIENDS about the #SockIt2PP campaign — via social media, email, in person — encouraging them to also send and pin socks! The information above is shared from STUDENTS FOR LIFE OF AMERICA. Can you imagine how twisted the minds of young people have become? This poor girl apparently thinks that a Pregnancy Care Center is evil in their mission of trying to help women through an unplanned pregnancy situation with love, free pregnancy tests, free ultrasounds, wise counsel… And yet she and many think erroneously that Planned Parenthood is good. Planned Parenthood does sound nice, I suppose. It is a very euphemistic name or “eugenic” name to be more correct. But what they do is refer women and young girls for ABORTIONS. And that is all they do. Other than giving out free birth control pills and encouraging women to be as sexually free as they wish. And when their “sexual freedom” has conceived via sin of fornication a human life, then Planned Parenthood conveniently sends them to a place where they can destroy the evidence of their sins i.e. their unborn babies. Our country has been going downhill and lying to its children for so long that the young people really do see Good as Evil and Evil as Good. Woe unto this country. One landmark in our degradation was when the US took prayer out of schools in 1963. One can see the downward spiral that has occurred from that alone. Not to mention teaching the kids in public schools the Theory of Evolution as if it were absolute fact and scientific truth. I must say that being taught Evolution really did mess up my mind and helped to shape my whole worldview. I can remember taking Honors Biology in 1986 with Ms. Hanes. She stood there and showed us the drawings of Ernst Haeckel. A German Evolutionary Biologist from the 19th century. Haekel’s postulation used to be called the “recapitulation theory”. It has long been eliminated from “real” scientific literature, but it is still being presented as a scientific reality by some evolutionist publications, including school textbooks. And it was so in my middle school text book in 1986. The term “recapitulation” is a condensation of the dictum “Ontogeny recapitulates phylogeny”. 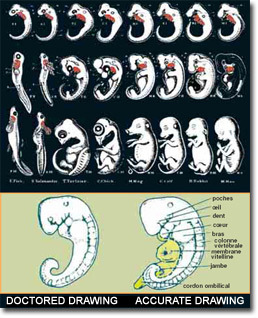 This theory of Haeckel’s postulates that living embryos re-experience the evolutionary process that their pseudo-ancestors underwent. He theorised that during its development in its mother’s womb, the human embryo first displayed the characteristics of a fish, and then those of a reptile, and finally those of a human. It has since been proven that this theory is completely bogus.It is now known that the “gills” that supposedly appear in the early stages of the human embryo are in fact the initial phases of the middle-ear canal, parathyroid, and thymus. The part of the embryo that was likened to the “egg yolk pouch” turns out to be a pouch that produces blood for the infant. The part that had been identified as a “tail” by Haeckel and his followers is in fact the backbone, which resembles a tail only because it takes shape before the legs do. These are universally acknowledged facts in the scientific world, and are accepted even by evolutionists themselves. George Gaylord Simpson, one of the founders of neo-Darwinism, writes: Haeckel misstated the evolutionary principle involved. It is now firmly established that ontogeny does not repeat phylogeny. (For full article see expert from book Harunyahya). I mention this scientific stuff because, again, as I said, it affected me and my worldview and thusly my life-choices. As an intelligent and bookish pre-teen taking an Honors Biology class, I took what they taught me as fact. Now I see that I was lied to and deceived mostly because the people that were teaching me were also lied to and deceived and were simply repeating and teaching what they had been taught as fact i.e. Darwinism and “Evolution” the theory. I shudder to think how many public schools still teach Evolution as fact. I know that in recent years there has been some progress in persuading some to also teach Intelligent Design. But this is limited. And so much damage has already been done. Is our nation going to be like the nation Israel? In Isaiah Chapter 5. God clearly shows us that though Israel was planted as a beloved vineyard, that it brought forth wild grapes. Isn’t that just like the U.S.? God has so richly blessed and cared for this country and planted it as a Christian Nation from its inception. But look at it now. Wild, Wild, Wild…. And God says in Isaiah 5: 20-23 Woe, Woe Woe! 5:20 Woe unto them that call evil good and good evil; that put darkness for light, and light for darkness; that put bitter for sweet, and sweet for bitter! If our Holy and Righteous Lord has stretched out his hand in anger to Israel, then what do you think He will do to a nation who teaches lies and does abominations such as mass murder of innocents? I think we, as a nation, have been warned. But if we go on with Pride and Impudence our county will continue to be destroyed, even utterly. God is not mocked.